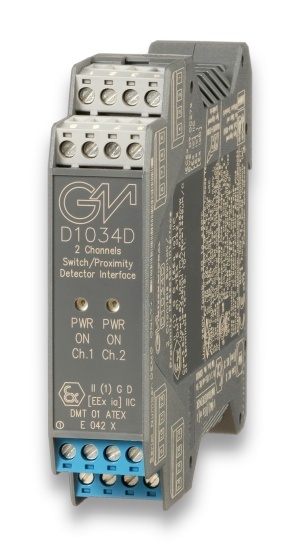 The dual channel DIN Rail Switch/Proximity Detector Interface, D1034D, is a high integrity repeater designed to interface contacts or proximity detectors located in Hazardous Area, maintaining a high level of loop integrity (safety integrity level SIL 3 according to IEC61508). Field loop integrity and status (line plus contact or proximitor) are continuously and directly monitored, in transparent mode, into the PLC, ESD, DCS using their existing input line, without requiring an additional channel for failure detection. This solution results in 100 % input channel saving with evident space, cost and failure risk benefits. • Short and open circuit fault detection.